I can't believe how quickly this summer flew by!! It was so nice to have a summer off from school and be able to get in some great vacations before I had to buckle down and begin work on my Masters. Classes officially begin tomorrow, but I don't start until a week from today. I am both excited and a bit nervous for classes to start..... a little anxious to see how it will be to balance out school, work, and running film labs. I was offered a graduate assistant position in the Cinema Studies department (which is where my undergrad is from) and gladly accepted. I think working with the other film professors is what I am most excited about!! Off to school you go! 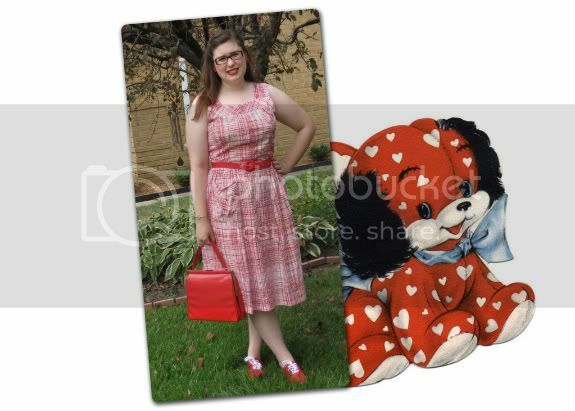 You always look so sweet in your awesome vintage clothes! Makes me smile when I see you in them. Summer has flown by hasn't it, but I'm pleased as I'm a winter gal! You look so, so cute in your dress! beautifully put together. I love the red!! God bless your new school year, girl. Work hard but take time for thrifting!